The kids ran through the sprinklers in the early afternoon while I painted the laundry room and Mickey cleaned out the garage enough to get both cars in. Yay! Mickey then remembered that he was supposed to be giving blood so off he went. I was thrilled the neighbor girl, B., was over playing with the kids. She's 14 and very sweet. That meant I only had to check on the kids while I continued painting. One time I checked on them I could hear them (obviously, they're rarely quiet) but couldn't see them. I followed the voices and found them doing this. 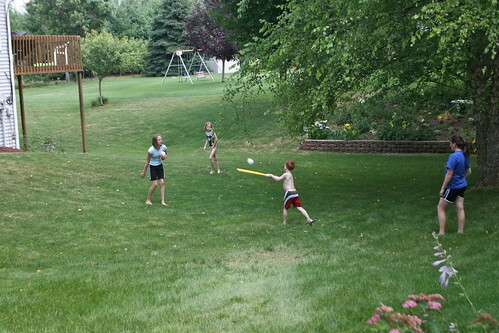 They had organized a little wiffle ball game in the yards between our houses. (Kade had just hit the ball when I took this picture.) They played for a while. Then they wanted to show B. our house. They gave her a tour. I'm sure it was fascinating with three tour guides talking at the same time. Then they all ended up watched Alice in Wonderland and then got a tour of B. 's house. The kids were so excited! They had a great afternoon.